Abraham Unger: elder of the Einlage Mennonite Brethren congregation, in the Chortitza settlement, Ukraine, in the forefront of the great movement among the Russian Mennonites which led to the formation of the Mennonite Brethren; born 6 January 1825 in Einlage, Chortitza Settlement, South Russia, the sixth of twelve children of Heinrich Peter Unger (11 April 1786 – 11 October 1855, Einlage, Chortitza, South Russia) and Margaretha (Sawatzky) Unger (15 March 1795, Rosenthal, Chortitza, South Russia – 14 November 1871, Einlage, Chortitza, South Russia). Abraham’s father was previously married to Margaretha Klassen (1793, Rosenthal, Chortitza, South Russia – 10 December, 1813, Einlage, Chortitza, South Russia), by whom he had two children. Abraham was married to Katharina Martens (b. ca. 1826, Rosenthal, Chortitza, South Russia). Abraham and Katharina had the following four children: Katharina, Margaretha, Abraham and David. Abraham died 12 March 1880 in Einlage, where he was buried 16 March 1880. On 4 March 1862, Abraham and his brother Heinrich were baptized by immersion by Gerhard Wieler in the Molotschna settlement. They returned home and on 18 March others followed his example, including his wife Katharina; hence 18 March 1862, is considered the date of the founding of the Einlage Mennonite Brethren Church. Unger was chosen as minister of the congregation. In 1859-60 he corresponded with J. G. Oncken, the Baptist preacher in Hamburg, and leaned strongly toward Baptist ideas. 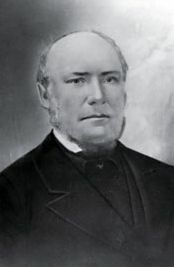 In 1868 he was chosen elder at a members' meeting conducted by Karl Benzien, a Baptist preacher; he was ordained 18 October 1869, by Oncken, who made the trip to Russia for the purpose at Unger's request. Under Unger's influence the Mennonite Brethren made baptism by immersion obligatory for their members, refusing to admit anyone to communion who had not thus been baptized. The entire period of his work was a stormy one. The opposing parties were very rigid toward each other. It was impossible to effect a union among the ministers. In the middle 1860's, when it seemed that the "overly-happy" (Ueberfröhlichen or Fröhliche Richtung) would gain the upper hand, they excommunicated him, but were unable to eliminate his influence. He succeeded in averting the danger threatening the brotherhood on the part of this group. In 1876 he resigned his position as elder, but was to the end of his life one of the most influential men of the brotherhood. Epp, Heinrich. Notizen aus dem Leben und Wirken des verstorbenen Ältesten Abraham Unger, dem Gründer der Einlager Mennoniten Brüdergemeinde (Recollections from the Life and Work of the Late Elder Abraham Unger, Founder of the Einlage Mennonite Brethren Congregation). Halbstadt, Gouv. Taurien : Selbstverlag, 1907; translated by Ida Toews and Ken Reddig and published in Direction (Fall, 1990): 127-139; (Spring 1991): 125-140. GRANDMA (The Genealogical Registry and Database of Mennonite Ancestry) Database, 5.00 ed. Fresno, CA: California Mennonite Historical Society, 2006: #351830. Braun, Abraham. "Unger, Abraham (1825-1880)." Global Anabaptist Mennonite Encyclopedia Online. 1959. Web. 19 Apr 2019. http://gameo.org/index.php?title=Unger,_Abraham_(1825-1880)&oldid=132192. Braun, Abraham. (1959). Unger, Abraham (1825-1880). Global Anabaptist Mennonite Encyclopedia Online. Retrieved 19 April 2019, from http://gameo.org/index.php?title=Unger,_Abraham_(1825-1880)&oldid=132192.